Spinal trauma can lead to permanent neurologic damage. In addition to the neurological deficit, spinal cord injury has additional important ramifications. This includes a precipitous decline in probability of employment, educational achievement, and intact marriage. Therefore, although spinal cord injury is relatively uncommon, spine imaging is frequently performed to exclude suspected and occult fractures. As a result of wide spread utilization, the positive yield of spine imaging is estimated to be only 2.4% in the cervical spine when all patient populations are included. Using the best available evidence, this chapter addresses diagnostic imaging of the spine in trauma including clinical prediction rules and cost-effectiveness. Dr. Blackmore wishes to acknowledge the chapters below and his coauthors on these chapters, Dr. J. B. Smith (1) and Dr. G. D. Avey (2). These chapters below were drawn upon for this current chapter in the process of presenting thoroughly updated and significantly revised coverage of this subject for emergency imaging. (1) Blackmore CC, Smith JB. Spine Trauma: Evidence-Based Neuroimaging. In Medina LS, et al., eds: Evidence-Based Neuroimaging Diagnosis and Treatment: Improving the Quality of Neuroimaging in Patient Care. NY: Springer Science; 2013. (2) Blackmore CC, Avey GD. Imaging of the Spine in Victims of Trauma. 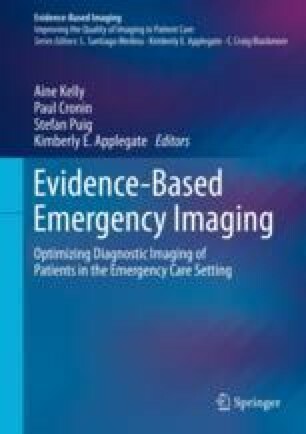 In Medina LS, et al., eds: Evidence-Based Imaging: Improving the Quality of Imaging in Patient Care. NY: Springer Science; 2011.